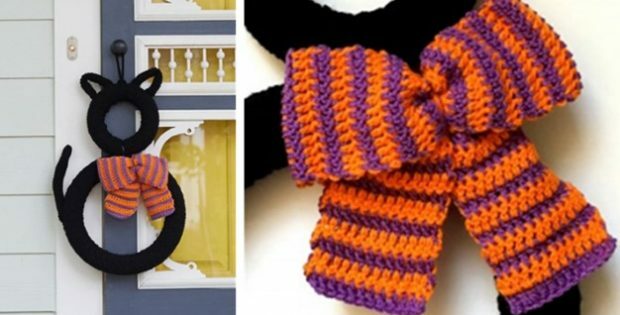 Greet your visitors with this charming superstitious black cat crocheted wreath during the Halloween season. Once completed, this superstitious cat should measure approx. 18 inches by 25 inches. If you prefer metric measurements, the finished wreath shaped like a black cat should be about 46 cm by 63.5 cm. The designer responsible for this haunting black cat in the form of a wreath is Sharon Mann over at Red Heart. Sharon has written a great crochet pattern that is very detailed. She has also rated the pattern for the cat wreath as intermediate. You can download the crochet pattern for this fun Halloween wreath for FREE, from the Red Heart website.